The Chevy Spark EV, GM's first electric-only car since 1999. GM says it wants to develop a car that can match Tesla's 200-mile range for less than half the price. The goal was laid-out Monday as the company announced a $20 million investment in its battery lab in Warren, Mich. But the company didn't give a specific time frame for achieving it. GM (GM)'s car would go 200 miles between charges and cost $30,000. Tesla's luxury Model S can travel 208 miles between charges, but it starts at $69,900. The start-up automaker said it hopes to have a mid-market car available in the $35,000 price range, but it says it will take three to four years to achieve that goal. Tesla spokeswoman had no comment on GM's goal. So far, Tesla's Model S range has been out of reach from any of the major automakers. Greater range requires a larger, more expensive battery pack. The cheaper electric-only cars now available from GM, Nissan and others go less 100 miles between charges. Those automakers point out that most people drive less than 40 miles a day. 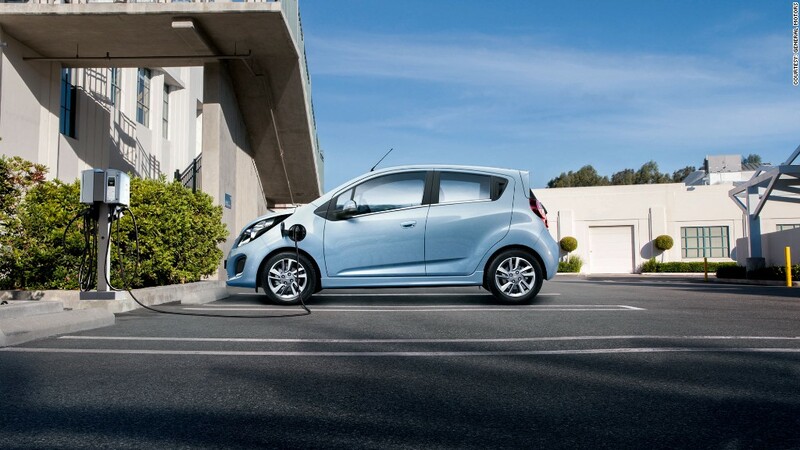 The Chevrolet Spark EV, which sells for $19,995 after a $7,500 tax credit, can go 82 miles on a charge. The gas version of the Spark gets about 34 miles per gallon and costs $12,170. GM's best-selling plug-in vehicle, the Chevy Volt, has both an electric motor and a gas engine to extend its range, allowing it to travel 40 miles on a single charge and an additional 350 miles on a tank of gas. The Spark EV is the first electric-only vehicle from GM since the EV1, which was made from 1996 to 1999. It went on sale two months ago and is only available in California and Oregon. GM sold 230 of the cars in the first two months. Tesla has been winning a lot of attention from both auto reviewers and investors since the introduction of the Model S last year. It won Car of the Year honors from Motor Trend and Automobile Magazine, and Consumer Reports has called it the best car it ever tested. Shares of Tesla (TSLA) have soared nearly 400% so far this year. Despite that rapid growth and attention, GM dwarfs Tesla in just about every way -- including vehicles sold, revenue, profits and global reach. But that doesn't mean GM isn't concerned about the success Tesla is enjoying and the impact it could have in the future. Earlier this year GM confirmed it has formed a task force within the company to look at the impact on GM from alternative automakers. The only alternative car company it named: Tesla.